Courtney Keen, a staff writer for Samaritan’s Purse, recently visited Nepal to cover emergency distributions. It shouldn’t be silent in Langtang, but it is. Walking through the decimated village, I saw evidence of lives cut short in an instant—scattered playing cards, a pair of kids’ sneakers, coats, food wrappers, overturned furniture. 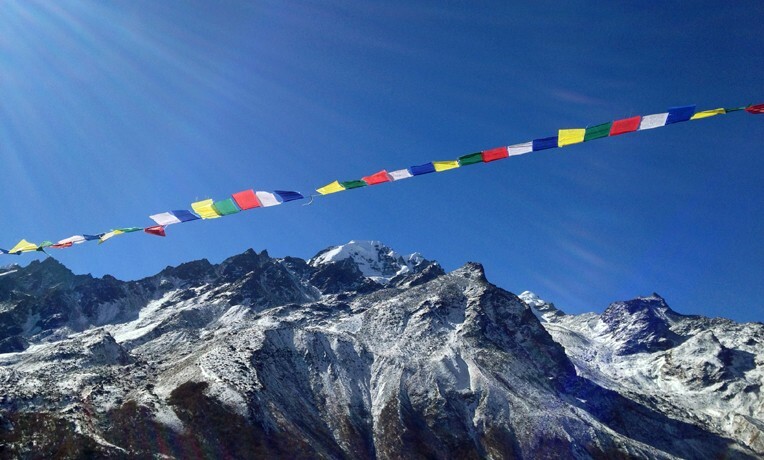 I noticed a string of prayer flags buried under some stones and began to pull them out; it seemed like they should fly. Then I stopped. Suppa lost his parents, two sisters, wife, and 11-year-old son to the earthquake. This is the breathtakingly beautiful, isolated Himalayan village where more than 300 people died in an avalanche during the April 25 earthquake. More than 100 bodies were never recovered. The prayer flags aren’t mine to free. Suppa Tamang led us through the remains of his village. He showed us where his brother lived and died. He pointed to the area where his teahouse used to be. Down the path he stopped in the exact spot where his sister-in-law was rescued from under the snow two days after the avalanche, miraculously still alive. But along with his brother, Suppa lost his parents, two sisters, wife, and 11-year-old son to the disaster. When the glacier broke off, Langtang barely stood a chance. The giant mass of snow and rocks not only buried most of the village, but the high winds and pressure also took out the forest on the mountainside across the valley and crumbled the homes nearby. It now looks like a wasteland surrounded by towering, snowcapped peaks. It’s not hard to understand why it used to be one of the top destinations for trekkers. But we were the only people in Langtang today: a survivor, a writer, a photographer, a translator, and a helicopter pilot. Since the earthquake, Suppa has continued to look after some elderly Langtang villagers who have no family. Earlier in the day, he had brought us to meet 92-year-old Samden Lama, who is now living one village over in Kyanjin Gomba. I couldn’t help but smile every time Suppa shouted my questions at her loud enough so that she could hear and respond. It was oddly tender. Suppa also helps with the needs of his community, including assisting with a recent Samaritan’s Purse winter supplies distribution to more than 100 families in the Langtang Valley. Our teams have been providing heavy blankets, clothes, solar lights, coats, sleeping mats, stoves, and other relief items for earthquake-affected families in hard-to-reach areas, like Kyanjin Gomba. Ours is some of the only assistance these villagers have received. Our efforts are meeting real needs and showing hurting people that they haven’t been forgotten. But there’s no recovery formula for an elderly woman still dreaming about the people who died in the avalanche or a man suffering the loss of almost his entire family. On our way out of Langtang, Suppa pulled up a video on his phone and crouched down next to me by some stones to shield the sun’s glare. It was an edited piece showing the new year’s celebration in the village a couple of years ago. Courtney watches the video of Langtang Valley two years earlier, when it was full of life. “That’s my wife,” he said, pointing to a beautiful woman in her mid-30s, dancing arm-in-arm with other women. Then it showed a group of men singing together. More people came into view singing and dancing, and he pointed out which of them were also lost. There had been so much movement and noise and life going on in this lonely rubble we now wandered through. After about a minute, we stood up and kept walking toward the helicopter—over piles of debris, past a big broken dresser, back across the foundation of his brother’s house. I held onto his phone as the video continued to play. The singing was loud coming through the speaker. It seemed to echo in the valley. When it ended, Langtang was silent again.